Dean Vogel, president of the California Teachers Association, did not mince words. “Outstanding teachers, award winning school administrators and the best education policy experts in the country have made it absolutely clear that the plaintiffs in this case are absolutely wrong,” he said. Kindergarten teacher Erica Jones agreed, despite having been a victim of one of the statute’s that the plaintiffs are hoping Treu strikes down. The Last In, First Out law, or LIFO, ensures teachers with seniority are spared from the lay-off guillotine in times of district-wide reductions. “If we took away these vital supports, I believe that would tear that team approach apart and we would revert to almost a ‘Hunger Games’ mentality,” he said. The plaintiffs’ press conference, held midday, before the defense presented its closing, was better attended with people from the courtroom who were there intentionally and some who “just followed the crowd,” as one person said. They also had twice as many speakers, including one of the girls whose name — Vergara — has become short-hand for the case. Sixteen year-old Elizabeth Vergara, self-consciously addressed the crowd — though at not quite five feet, she was hard to see over the podium. “I never thought I’d be talking to this many reporters,” she said nervously. “But right now we’re kids and we can’t do this alone,” she said. She went on: “It was scary telling my story to a judge but I’m glad I did. And I’m glad about my sister Beatriz and the other plaintiff’s [were able to] tell their stories, too. 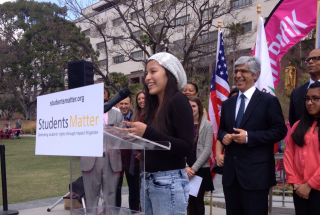 The money man behind the student plaintiffs in the lawsuit, David Welch, founder of Students Matter, a nonprofit organization, spoke briefly saying, the nine-students who have become the face of the landmark suit are surrogates for all of the children in California, everyone of whom deserves access to high quality teaching. Russlynn Ali, a Students Matter board member and former Assistant Secretary for Civil Rights at the U.S. Department of Education, said the case could have national implications.